Villa Alaties offers a colonial decor and feel, in addition being designed to blend into the traditional authentic architecture associated with the North of Cephalonia. Villa Alaties is equipped with modern fittings and appliances to make your experience comfortable. Halikeri is a peaceful hamlet with only a handful of luxury villas doted around in private locations. 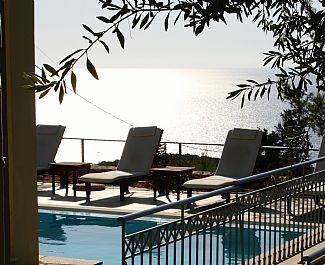 Some of the best views in Kefalonia are from this location with amazing sunsets which can be enjoyed from the infinity swimming pool and balconies (traditional outside furnishings provided). 10-15 mins walk / under 5 mins drive to Agia Jerusalim beach and 20 mins walk to the cove of Alaties; both have tavernas. The village of Maganos with tavernas, supermarket and green grocers is 5 mins away by car. The resort of Fiskardo with its boutiques, restaurants, bank, cash points, supermarkets, post office, boat hire and diving school is a 10 mins drive. There is a medical centre at Vasilikades 15 mins drive away. Two separate main bathrooms. En-suite to master bedroom. All have shower facilities. The colonial decor and paintings with double balcony doors that have amazing sea views, provides relaxation for those non sun worshipers. Fully air conditioned with a large dining table seating 6 persons, DVD Player, CD player and sofas. The kitchen is well equipped to service 8 quests with modern German fittings such as an electric hob, fan oven, microwave, fridge/freezer and a dishwasher. Notes on accommodation: Villa Alaties also enjoys modern fittings and appliances to make your experience comfortable but authentic. Outside: It enjoys spectacular views and sunsets with its own infinity pool. The exterior furniture consists of a dining table with 5 chairs, umbrellas and 6 sun loungers. All the outside furniture has comfortable covers, so you can relax. Cleaning / Towels / Linen / Maid service: Their is a maid service with linen and towel changes weekly or by request every 3 days. Perfect location, lovely villa and beautiful sunsets! A beautiful island stoping in a lovely villa. Near a lovely beach and not far to restaurants and supermarkets in the local village - 5 minutes in the car. A roomy villa with good facilities, clean and comfortable for 8 people- 3 doubles and a room with 2 singles. Great pool with great views. You do need a car in this area. A great holiday in a wonderful spot! We all much enjoyed our 10 days at Villa Alaties LIght bright house with amazing sea views. Well equipped (though no washing machine) and comfy sofas. Great location with 2 lovely beaches (both with cafes) within easy walking distance. Sunsets and starry skies were awesome. I am so glad you enjoyed your stay, and hope to see you soon. The property is in a stunning location with panoramic views of the sea. The property is well equipped and clean. The views are stunning with some fabulous sunsets. The pool and outside area is also well maintained. My family and I had a fantastic stay here. There is one taverna within walking distance which provided great traditional Greek food. You do need a car to get anywhere else which was the only draw back as the roads are not great and take a day or so to get used to! I am delighted you had a lovely time at the villa, and I would alsways recommend a car even though a local taverna and beach is in easy walking distance. Great property - stunning sunsets! My wife & I recently returned home from a 9 x day holiday in Kefalonia staying at villa Alaties. I have to say - what a great find, the villa was lovely with excellent facilities. You really do need a car to get anywhere but it is well worthwhile. The local Jerusalem beach & taverna was lovely & we frequented both several times. The other nearby taverna which had lovely sunset views was also good. We made the 15 minute or so car journey into Fiscardo on 5 or 6 occassions & thought the place was really lovely. The highlight for me though was sitting with a cold beer watching the stunning sunsets from the villa. Located only 10-15 minutess walk from St Jerusalem beach. A short drive to the famous harbors of Assos, Fiskardo and the spectacular Myrtos beach. The resort of Fiskardo with its boutiques, restaurants, cash points, supermarkets, post office, boat hire and diving school is only a 10 mins drive. There is a medical centre at Vasilikades 15 mins drive away. The village of Maganos with tavernas, supermarket and green grocers is 5 mins away by car. Booking Notes: Please contact owner for details. Changeover Day: Please contact owner for details.